Do you read Death’s words as a threat, a promise, or a desperate plea? The ambiguity adds thrill-power to this scene. Love the compact storytelling as we're introduced to our team of ghost-thieves and locale at the same time. 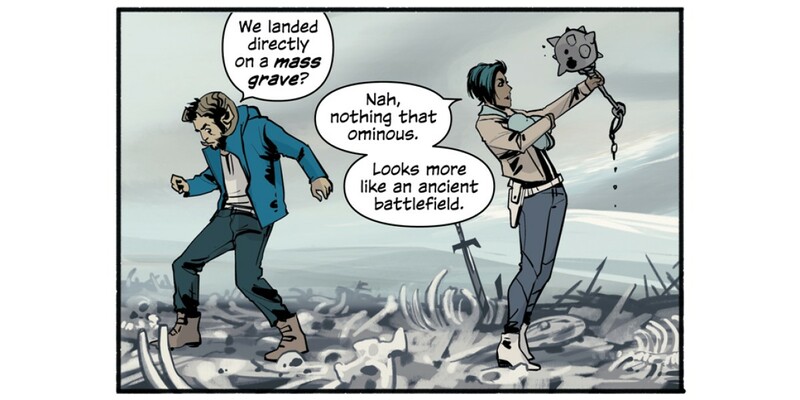 Marko and Alana spend a lot of SAGA taking outrageous developments in stride, and this is proof positive. There are few simple pleasures that are more enjoyable than a properly bombastic fight scene. This is what desperation looks like. Rick's caught between rock-greys and hard, inky blacks.